There's tough, and then there's Ford tough. The 2017 Ford F-150 Raptor is a high-strength, military-grade pickup truck that combines power, performance, and safety in one stunning package. Available in SuperCab and SuperCrew, seven exterior colours — including Avalanche Grey and Lighting Blue — best-in-class payload, and SuperCab and SuperCrew, this Ford F-150 truck has something for everyone. At Van Isle Ford, we think everyone on Vancouver Island needs to learn more about this versatile full-size truck that can handle our challenging weather. When you drive Ford trucks, you expect to dominate the road. For this reason, the 2017 Ford F-150 Raptor comes with a powerful 3.5-liter EcoBoost High Output Engine with Auto Start/Stop that produces 450 horsepower at 5,000 rpm and 510 lb.-ft. of torque at 3,500 rpm. This latest EcoBoost engine offers 6 percent higher city (12.2L/100 km) and 11 percent higher combined fuel economy (10.9L/100 km) than the previous generations. You get full control over this amazing truck thanks to the SelectShift 10-speed transmission with Tow/Haul Mode and Progressive Range Select. The ride is smooth and stable no matter the terrain thanks to the standard 3.0-inch FOX Racing Shox with custom internal bypass technology that allows variable damping rates based on wheel travel. Off-roading gets even due to the Terrain Management System with six selectable drive modes and Hill Descent Control. Since you may also be towing with the 2017 Ford F-150 Raptor, it comes with a slew of smart towing features like Pro Trailer Backup Assist, dynamic hitch assist, Smart Tow Connector, and a trailer brake controller. The experts at Ford feel that the 2017 Ford F-150 Raptor is one of the safest full-size pickup trucks ever built. Each Ford F-150 received nearly 10 million miles of cumulative torture testing, has become an IIHS Top Safety Pick, and received an NHTSA 5-star safety rating. Some of the more impressive standard safety features on the 2017 Ford F-150 Raptor include AdvanceTrac with Roll Stability Control, front seat-mounted side airbags, Curve Control, Safety Canopy side curtain airbags and an SOS Post-Crash Alert System. 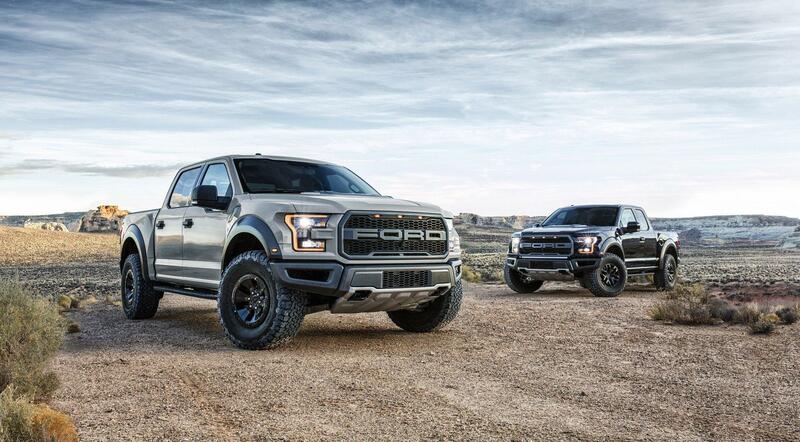 You know that the 2017 Ford F-150 Raptor is tough, powerful, and safe, but it is also a high-end truck packed with the latest technology and connectivity features. Because you'll be doing plenty of work in your Ford F-150 Raptor, there is a standard 110-volt/400-watt Power Inverter - Instrument Panel and Rear Flow-Through Console that allows you to charge everything from your phone to a cordless power tool. Other amazing standards and available tech features include.and available tech features include. To keep you connected and entertained, the 2017 Ford F-150 Raptor comes standard with an SYNC 3 interface that has a capacitive touch screen with swipe feature, navigation with pinch-to-zoom functionality, Siri Eyes Free, Wi-Fi, and Android Auto. There is also SiriusXM Satellite Radio, available Kicker subwoofer, and Sony single CD player. If you want to learn more about how the 2017 Ford F-150 Raptor is the perfect truck for you, please contact or visit Van Isle Ford today. We really want to give you the opportunity to test-drive one of the most impressive trucks on the market today.